Poori is one of the popular breakfast dish across India. 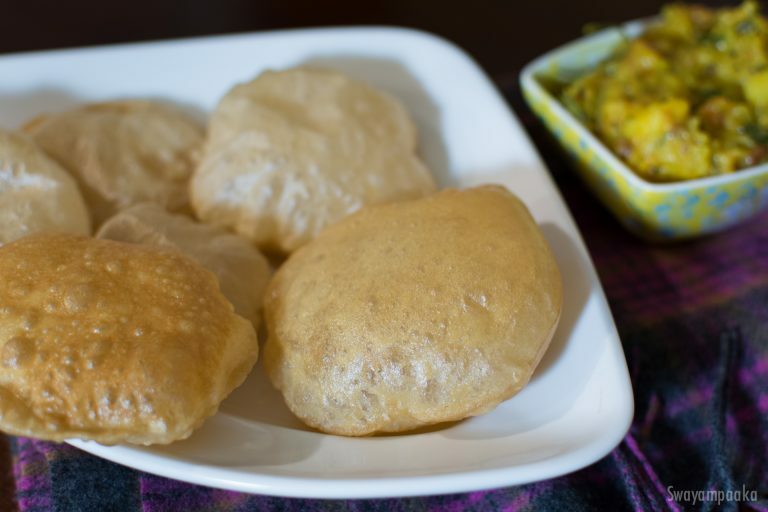 Deep fried indian bread poori is very easy to make, very delicious and addictiveAlmost every kid loves Poori. The popular combination in south indian restaurants with this poori is Vegetable Sagu and Bombay Sagu/ Potato Sagu which is mainly popularized by MTR restaurant in Bangalore. Mix flour, salt, sugar and oil in a bowl. Knead it for a minute or so until you get the soft, smooth dough. Keep it covered for 10 minutes. You can make pooris immediately too. Take one portion, roll it to medium thickness circles. ( not too thin, not too thick) If the dough is sticking to the pin, smear some oil on the board and roll it. Roll 4 to 5 pooris ready. Heat the oil in a wok/pan to fry pooris on medium high heat. The oil should be hot to get good pooris, but not smoking hot. Once the oil is hot enough( to check drop a small piece of dough into the oil. The dough should come up immediately to the surface.) add the prepared poori, press it gently on top using perforated ladle / skimmer. It will help the poori to puff up. Turn it to the other side and fry it for few seconds until this side also becomes golden brown. Now remove it using perforated ladle onto a paper towel. Repeat the same procedure with remaining dough.